Posted April 12, 2016 by Film and Religion & filed under New Films. Iona is a lyrical, reflective drama that owes an obvious debt to the film-making of Andrei Tarkovsky and Carl Dreyer. That is both what makes it so refreshing and sometimes so frustrating. It’s a lowish-budget British drama that doesn’t rely on social realist conventions. Dialogue is kept to a minimum. Plot details are only very gradually revealed. 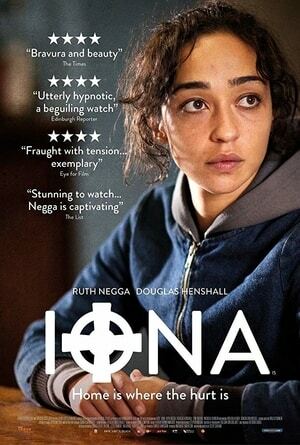 Iona is both the name of the main character (played by Ruth Negga) and the Scottish island on which the film is set. Iona and her troubled teenage son, Bull, are heading there. She left the island many years before…. Graham makes excellent use of the Hebridean landscapes. He pays close attention to the part religion plays in the island’s life and deals very sensitively with the courtship between Bull and a beautiful young girl (Sorcha Groundsell) who can’t walk. In a Tarkovsky or as Dreyer film, though, the mysticism would have been pushed further. There would have been some miraculous happening – some attempt at transcendence. Graham, by contrast, is a little too reticent. The more we learn about the characters, the less mysterious and magical they become.